Throughout much of human history, the arrival of the vernal equinox has been celebrated through rituals. But we are not the only creatures with springtime rituals. Here in the Northern Hemisphere, in streams and vernal pools, many amphibians are engaging in their annual spring mating rituals. In this issue of Leaf Litter, we’ve decided to showcase one of them: the salamander. There is a great deal of lore associated with the secretive, nocturnal, salamander. Many ancient accounts say salamanders were born of fire. 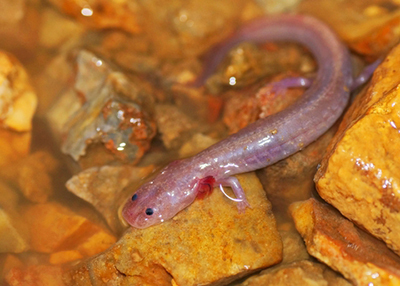 Others warn of the salamander’s ability to instantly poison wells, orchards, and even kings. Today, we know that while salamanders do secrete toxins, and while a salamander hibernating in a log that is thrown into a fire will indeed emerge from that fire, those ancient claims are fantastical. That is not to say, though, that the salamander isn’t a fantastic and utterly fascinating animal. Salamanders are incredibly biodiverse, with 675 species that range widely in size, shape, color, and habitat. Some, like the redback salamander (Plethodon cinereus), are totally terrestrial. Others, like the two-legged greater siren (Siren lacertian) are totally aquatic. Semi-aquatic salamanders like the spotted salamander (Ambystoma maculatum), require water for breeding. Then you have a species like the aquatic red spotted newt (Notophthalmus v. viridescens), which metamorphoses into a terrestrial red eft for about two years before returning to an aquatic life. Though we still have much to learn about the ecological role of salamanders, we know that they are centrally nested in food webs, and studies suggest that they play an important role in leaf litter decomposition and nutrient recycling in forest systems. Salamanders are used in medical research on topics ranging from cell biology and genetics to limb and tissue regeneration. One of the most fascinating things about salamanders is an attribute that also makes them vulnerable: they are extremely sensitive to changes in their environment. Respiration for many salamanders occurs primarily through the skin, so clean water is essential for survival. For that reason, salamanders are often used as bio-indicators of water quality and watershed health. Salamanders may seem abundant, at least in the U.S., which is a biodiversity hot spot, but they face some very serious threats. Lurking just behind habitat degradation is disease. Salamanders not only have to contend with the amphibian diseases ranaviruses and chytrid fungus (Batrachochytrium dendrobatidis – Bd), but with a newly discovered relative of Bd, known as Bsal, which has already taken a toll on European fire salmanders (Salamandra salamandra). Other threats include invasive species and exploitation in the pet trade. Given salamanders’ sensitivity and their dependence on specific moisture and temperature conditions, it is not surprising that climate change also makes an appearance on the creature’s list of threats. 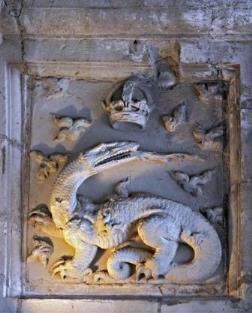 But there is hope for the salamander. 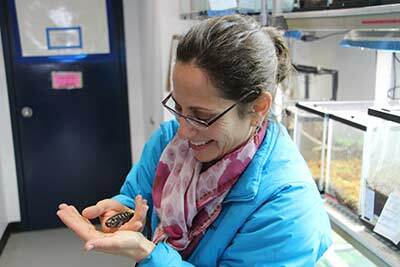 Many of the people featured in this issue of Leaf Litterare deeply involved in research and outreach efforts aimed at salamander protection and conservation. Among them, Dr. Karen Lips from the University of Maryland. 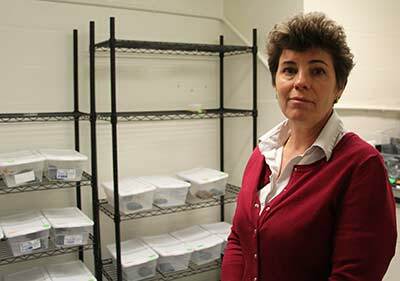 She was instrumental in the discovery of Bd 20 years ago, and today, she is at the leading edge research related to both Bd and Bsal. We also chat with Dr. Ray Semlitsch, whose work at the University of Missouri is helping scientists and conservationists to better understand the role of salamanders in forest ecosystems. 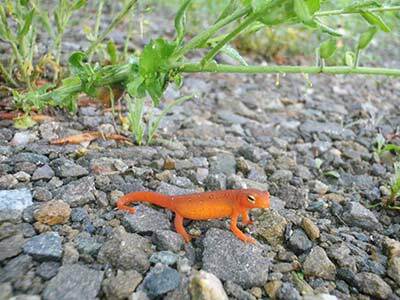 Links to other salamander conservation efforts and information can be found in the resources section of this issue. There is something else about salamanders that gives me hope for them, and it’s something I didn’t expect: they are captivating. I know this—really know this—not from anything I read, but from my experience holding one in my hand. 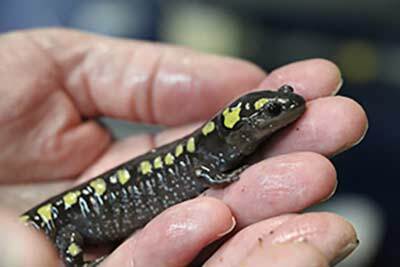 While interviewing the National Aquarium’s general curator Jack Cover for this issue, I asked if I could hold one of the spotted salamanders (Ambystoma maculatum) used in their outreach programs. After washing my hands and misting them with cold, clean water, I got to do just that. Suddenly, this incredibly sensitive creature I had been reading about, this small being, so vulnerable to threats brought on by my species…was in my palm, and in my trust. To be honest, as much as I care for all living things and appreciate their intrinsic value, my normal reaction to dark and slimy creatures is to recoil. Not so with this salamander. As his tiny toes gripped the folds in my palm, I felt a tinge of excitement–perhaps akin to the “discovery moment” Kevin Barrett of the Maryland Zoo described in witnessing visitors’ reaction to the eastern hellbender exhibit. I swear, the spotted salamander and I looked each other in the eye. Whether he just appeared to be smiling or actually was, he enchanted me, and I somehow came to care about the survival of his kind more deeply than I had before this encounter. So I find hope in the thought that if I can find salamanders captivating, anyone will. And so many of us in North America can! These creatures live in our parks, backyards, and even windowsills. My colleagues just spotted a redback salamander (Plethodon cinereus) while doing field work in Baltimore City. We humans may hold the fate of animals like the polar bear and North Atlantic right whale in our hands, but we can’t actually hold them. 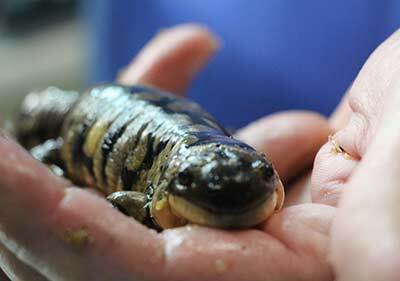 Could the salamander hold untapped potential as a conservation ambassador? Let us know what you think by commenting on our Rhizome blog.